Nothing is more refreshing than the sweet taste of peaches combined with the powerful health support of aloe vera gel. This distinctive and wildly popular variety rounds out the new tripack. 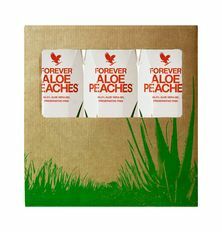 Forever Aloe Peaches is enhanced with natural peach flavour and peach purée. Warning If you are pregnant, breastfeeding, planning pregnancy, taking any medications or are under medical supervision, please consult a doctor or healthcare professional before use.